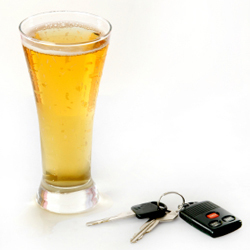 QUEBEC – Starting Sunday, the “zero alcohol” rule for Quebec drivers age 21 and under comes into force, meaning that young motorists face an immediate three-month suspension of their licence if they’re found to have consumed even a drop of alcohol before getting behind the wheel. Although the legal blood-alcohol limit for older Quebec drivers remains fixed at .08 per cent, the arrival in force of the new law means young drivers must now spend the first five years they are on the road totally sober, said Gino Desrosiers, a spokesperson for the Société d’assurance automobile du Québec. While public health campaigns have for years made this plea, the new law makes it mandatory. Desrosiers said statistics show that among 19-year-old Quebec drivers who die in highway accidents, 33 per cent have alcohol in their blood and 25 per cent have over .08 per cent alcohol. The figures are worse for drivers age 20 to 21 killed in accidents. As many as 56 per cent have some alcohol in their blood and 48 per cent have over .08 per cent. Young drivers found after Sunday to be driving with the otherwise legal limit of .08 per cent could be fined between $300 and $600, and lose four demerit points. The SAAQ has sent about 110,000 letters directly to young Quebec drivers affected by the new rule. Desrosiers explained that at present anyone getting a learner’s permit at 16 was already forbidden from drinking and driving in their first year of learning. Ditto for the two years after, when their licence is provisional. But the new rules extend it all the way up until reaching the age of 22. Marie Claude Morin, Quebec spokesperson for Mothers Against Drunk Driving, said some young people may consider the new rule unfair for targeting young drivers. “Yes, we are,” Morin said. “Car crashes still are the leading cause of death in the 16 to 24 age range. Morin said young drivers, not much-maligned repeat offenders, cause more accidents. In fact, she said, 30 per cent of accidents are caused by motorists convicted more than once of impaired driving while 70 per cent are caused by someone committing a first offence. “And a lot of them are young people,” she said. Four people die and 190 are injured every day on Canada’s roads by the actions of drunk drivers, said Morin, pointing out that Quebec’s consultative body on highway safety called for extending the zero-alcohol regulation to age 25. The new rule allows police to stop younger drivers. “I think it will wake up a few kids who are taking risks that they shouldn’t be taking and hopefully they will get into a habit of making a difference between driving and drinking alcohol for the rest of their lives,” Morin said. “To us it is a good measure. It has proven efficient elsewhere,” she said. Ontario, Manitoba and New Brunswick have the same zero-alcohol rule already. Morin said Bill 71, enacting the new rule for young drivers, also toughened the rules for repeat drunk drivers. But then-transport minister Sam Hamad accepted the appeal of bar owners that Quebec maintain its .08-per-cent alcohol limit, rather than joining the other nine provinces and lowering it to .05 per cent. On Friday filmmaker Marie Nadeau, whose documentary Arme à quatre roués will be shown at 8 p.m. Sunday on Télé-Québec, launched a petition calling on the SAAQ to cease its practice of paying compensation to drivers convicted under the Criminal Code of causing accidents and deaths, proposing instead that the money be given to the families of deceased victims. “It is a very unfair situation,” Morin agreed, saying MADD supports this measure and would go farther, making wealthy drivers who cause highway deaths pay compensation. “The victims are left with very little,” Morin said and must pay their own therapy and other expenses. Sylvie Roy, the Coalition Avenir Québec MNA who has agreed to sponsor the petition, said zero alcohol for young drivers is a good idea.